Christopher Barzman comments on everything from modern culture, local events, food & restaurants, high performance automobiles, electronics, Apple Macintosh Computers and Products, iPhone and more! Know that glazed-over look non-car people's eyes get when you start waxing eloquent about lap times and why AWD is the devil's work? Well, this is what you sound like. Moron Of The Day Does Burnout In Dodge SRT10 Truck And Flips It! New SNL Cast Member Drops The F-Bomb On Her First Night! Gotta love this. New cast member Jenny Slate's first night on the show. It's kinda like being the first one to spill a drink at a party. What!? No cellphone signal? What are the odds? After a little time away... I'm back! The new Nissan GT-R wasn't able to best the Corvette ZR1's 7:26.4 standing Nurburgring record lap time, but Godzilla did bring the hurt with a lap time of 7:26.7 run on April 23, 2009. Now there's in-car video proof. Nissan's Chief test driver, Toshio Suzuki hopped behind the wheel of the newly revised 2010 GT-R in an attempt to shave an additional 3 seconds off the previous 7 minute 29 second lap time. He accomplished his goal — but in the grand scheme of things, who cares if he didn't beat the competition? It’s still a helluva fast run around an extremely technical course. More Ken Block Madness. This Time He's On Top Gear! Internet sensation, and my current personal car control hero, Ken Block was on Top Gear last night giving old Captain Slow, James May, a little spin. Or should I say several spins. Russia's Got Talent! Well, maybe not. Starting the day off with a FREE Motor Trend Magazine subscription. 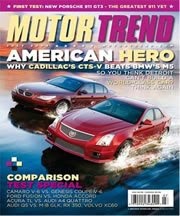 Click HERE to get your FREE Motor Trend subscription. Casual clothing brand Uniqlo has created the most captivating web calendar ever, featuring a random assortment of stop-motion tilt-shift imagery from locations across Japan and charming background music by Fantastic Plastic Machine. I liked it so much, I planted one in the sidebar. Highly addictive. Look At What I Just Made! An iPhone Dock Out Of Recycled CD's! OK, this is really sweet, an iPhone dock made out of recycled CD's. I just threw this together, and it took me all of an hour and 2 beers to make. It was really easy, I had everything I needed to make it lying around the garage. I highly recommend building one yourself. Hit counter provided by website-hit-counters.com website.